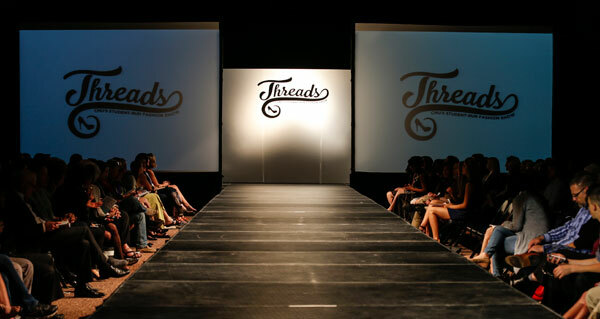 Going into the fashion and merchandising major at Central Michigan University, one hopes to get the chance to show in Threads, the student-run fashion show. At least that was my goal. I knew that in order to get noticed, I needed to create pieces to walk to runway. My chance came and I met my goal when I heard there was going to be a collection development class that revolved around Threads. The class started with understanding what the student wanted and what their ideas were, right down to the details like shoes and jewelry. Incorporating such elements introduced the designers to what is going to actually happen if they ever wish to show their works in a fashion show. I started with my sketches and worked through the possibilities at hand. I searched fabrics and other details to find just what I was looking for. The class had set goals and timelines, and we worked hard to meet them and make our designs a reality. I worked very hard to finish and bring my garments to life. Long hours, hand stitching, and a close friendship with caffeine were my life for months leading to the show. My energy was focused on completing my work and making sure it was how I wanted it. I was ecstatic when the elements of the show started to fall into place. The light at the end of the runway was becoming brighter. I included jewelry, shoes, and hairstyles that pulled together my looks. The rehearsal made me even more eager for the real show and allowing the people I know see where I had put all my time and energy. The Threads Fashion Show was my small chance to show what I am capable of. When I sat in the audience and watched my models walk down the runway, I felt like I was on four pots of coffee. I was nervous and hopeful and shaking from the excitement. The opportunity to show my garments in Threads further confirmed my love of apparel design and my passion to do better next year with my senior collection.